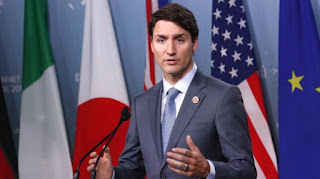 Canadian Prime Minister Justin Trudeau forcefully responded to Donald Trump trade threats at the Group of Seven summit in Quebec, vowing Saturday that Canada won’t be “pushed around” in a confrontation with the U.S. The war of words between Trudeau and Trump escalated after the U.S. president left the meeting early. Trump fired back at Trudeau’s comments in a tweet later Saturday that called the Canadian leader “meek and mild” during the meeting of allies. The president also tweeted that he was revoking U.S. endorsement of the summit’s final joint statement.